So remember those Pumpkin Streusel Muffins I made last week? 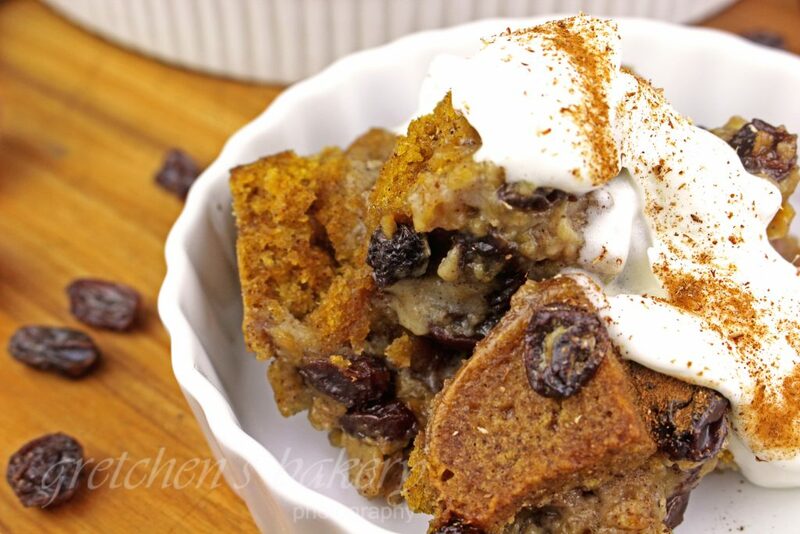 Well I didn’t tell you this, but that same day I also made a pumpkin bread out of it for the sole purpose of making this Pumpkin Bread Pudding with spiced whipped cream! Secrets secrets, but obviously I can’t keep them for very long! When I owned my bakery people would start asking for pumpkin bread at the beginning of September; however we were still making the blueberry breads, and lemon loaves at that time as we started to wind down from summer. Pumpkin bread and other pumpkin desserts didn’t really hit the scene until early to mid October, especially because in New Jersey it could still be 75°F on October 1st! But the demand was just so great that Pumpkin Bread eventually made its way to the production list by first week of October. This then opened the door for the next great thing. 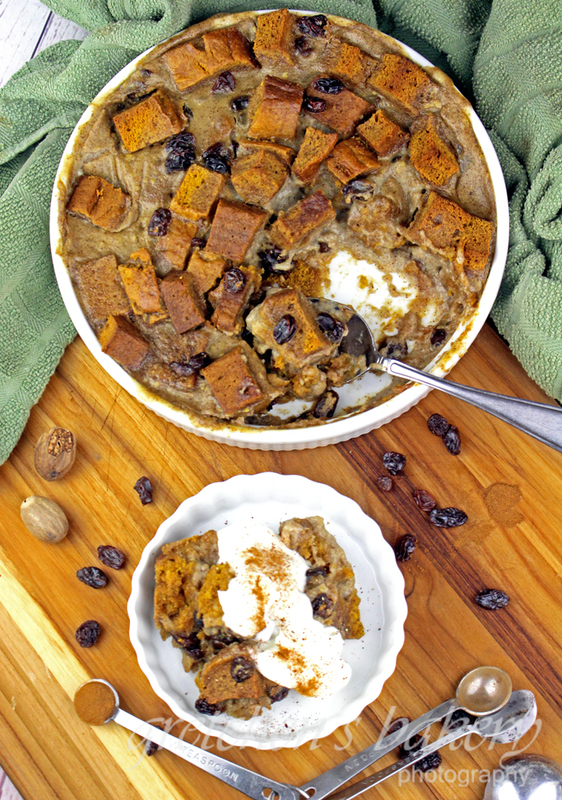 Oh how I love a hefty scoop of warm pumpkin bread pudding loaded up with fall spiced coconut whipped cream! I’ve added raisins to mine, but I know many people have an aversion to raisins so of course you can leave those out! I thought dried cranberries or even pecans would be a nice addition, so you can really add anything you like. Pumpkin has a way of complimenting so many different add ins, like chocolate, nuts and all the dried fruits; so get creative and make this one your own! Bake and cool your pumpkin bread recipe ahead of time and I like to put mine in the refrigerator to get it cold so it is easier to cut and keep in cubes. Pumpkin bread pudding must be kept refrigerated but is best served warm (in my opinion) many people eat it cold though!